After a week of heavy combat, Muammar Gaddafi’s forces have been able to advance their positions greatly. 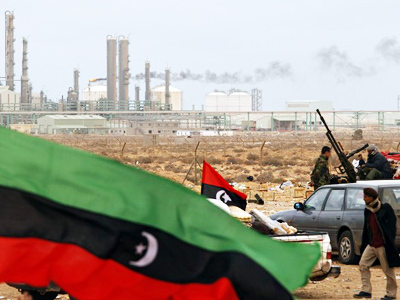 Sunday, Libyan television reported the loyalists have gained control of the oil town of Brega, following successes in Zawiyah and Ras Lanuf. At the same time, according to the local TV station reports, the port city of Ras Lanuf has been cleaned of Al-Qaeda supporters. 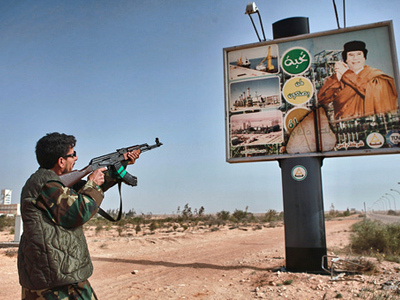 For several days now Gaddafi’s forces have remained in control there too. 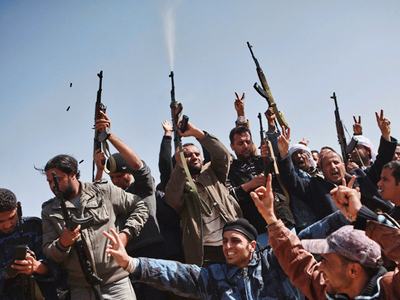 On the ground in Libya, while it certainly does seem as if Gaddafi’s men are pushing back and winning the battle there, on the international stage it is the rebels who are really coming in the front. The EU ministers in Brussels met on Friday for the second round of negotiations over the international response. Leaders of major powers discussed whether or not to go ahead with some kind of no-fly zone or foreign intervention. 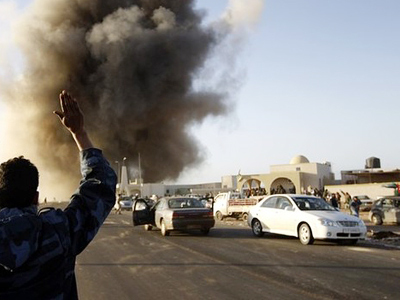 The International Red Cross describes Libya as now being in the midst of a civil war. Ministers from the Gulf Co-operation Council – which represents six Arab states – have called the Libyan regime illegitimate. However, Libyans themselves do not consider the situation being that serious. Many locals make the point that the global media's tendency to put drama above reality is encouraging foreign intervention. 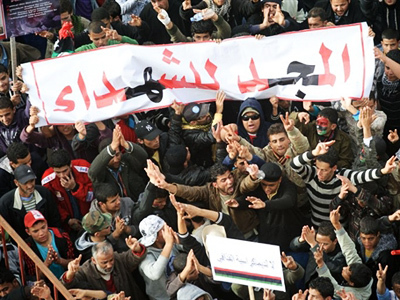 There is good deal more negotiating happening on the international stage over the merits of intervention and a no-fly zone than the bargaining taking place in the downtown Tripoli market. Shops here close early nowadays. People are afraid and many of the Africans who used to work here have fled the country. And the argument that Libya is on the brink of civil war, so foreign intervention is needed, still seems to ring a little hollow. “There have been several hundred people killed, but it is not a huge level of violence. It certainly is not a global level of violence that would normally merit intervention,” John Laughland from the Institute of Democracy and Co-operation. Gaddafi has offered access to foreign media, but only if the camera lenses stay well away from any of the opposition. But it is a similar picture in the opposition strongholds. Dr. Ramadan Breki, the director of the Quryna newspaper was forced to close the Benghazi office of his newspaper because of pressure from rebels. You have to print their version of events, he says, or nothing at all. “The media is going to the hotspots and all these cities are controlled by the rebels and the independent people, they are afraid and they cannot tell the news what they think and what they believe,” explains Breki. And many of Gaddafi’s supporters fear that while he may be winning the war with the rebels, he is losing the information war. Schoolgirl Mona Jama Mohammed from Janzur, a town some 13km away from the capital Tripoli, says she is puzzled and angered by reports that mercenaries were shooting people in her town. “It is normal: teachers come and we get the lessons, and we write the homework. Normal life,” she says. And life certainly seems calm on the streets. As for conflicts elsewhere where the death count is climbing. There is little media coverage and even less foreign interest to intervene. “There are events unfolding now in [Cote d’Ivoire], where there is also an armed conflict between rebels and the government, but nobody seems to be thinking of that. It is only because fashionable attention is focused on Libya,” says John Laughland from the Institute of Democracy and Co-operation. 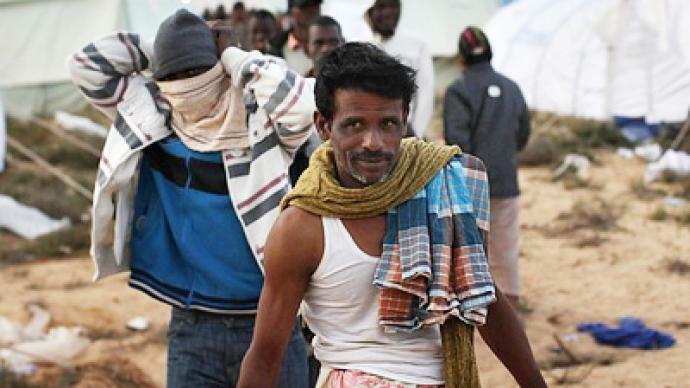 So as leaders met in Brussels to discuss the fate of a country hundreds of miles away, many Libyans are saying that it is their mess, and they will clean it up. ­It is, first of all, time that plays in Gaddafi’s favor, as the revolutionary impulse is slowly fading, believes Igor Khokhlov, a political expert from Russia's Academy of Sciences. Besides, Gaddafi, in Khokhlov’s opinion, has proven to be a perfect tactician. “He has regained control over a few key cities, and now he’s fighting to get control over the few facilities in Libya, for example, the power station that provides electricity for the eastern part of the country. So, quite likely, the rebels will be cut off of [from a] power supply very soon,” said Khokhlov.